Virtual machines encryption. Finally, vSphere has obtained VMDK virtual disks-level encryption, which works independently of guest OS in the virtual machine. VM hot migration traffic encryption (vMotion Encryption). 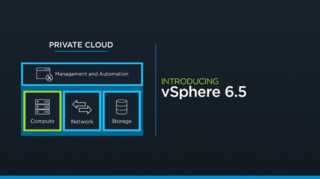 This feature has been requested by the users for a long time, and now finally has been implemented in VMware vSphere 6.5. Secure download support (Secure Boot). Now, when downloading UEFI, firmware validates VMkernel core digital signature in accordance with the certificate stored in firmware. Enhanced Logging. This mechanism has been substantially revised and has become event-oriented. Virtual machine lifecycle management automation. In vSphere 6.5, VMware Update Manager (VUM) has been completely integrated with VMware vCenter Server Appliance and fully supports all patching and update operations. Proactive HA features. That’s an interesting stuff. Now in cooperation with hardware vendors VMware developed the mechanism of proactive discovery of a host fault with hardware sensors. vSphere HA Orchestrated Restart feature. Now VMware HA allows to consider services interconnections in virtual machines when restarting them in case of fault, based on preset VM-to-VM dependence rules by recovery priority. Simplified HA Admission Control. Before, it was not quite clear how HA Admission Control works. Now it is only host failures to tolerate (FTT) parameter that the administrator must define, meaning the number of hosts faults the virtual infrastructure should go through with reserve of compute capacity. Fault Tolerance (FT) Now DRS is more tightly integrated with FT – when settling placement of FT-machines, host’s network bandwidth is considered, since it’s crucially important for such VMs. New DRS Advanced Options. Now there are 3 new options for DRS in advanced settings (for example, for balanced distribution of VMs by number on hosts). Network-Aware DRS features. Now DRS doesn’t migrate and doesn’t place a VM on hosts with over 80% network resource utilization. SIOC and SPBM integration. Now Storage IO Control features work with Storage Policies and IO limits based on vSphere APIs for IO Filtering (VAIO) mechanism. Content Library improvements. Now it’s possible to mount ISO image and set up customization profile directly from the Content Library. Development and automation interfaces improvements. Now there is API Explorer, which is a convenient tool to learn about vSphere REST APIs features to solve administration or development tasks. 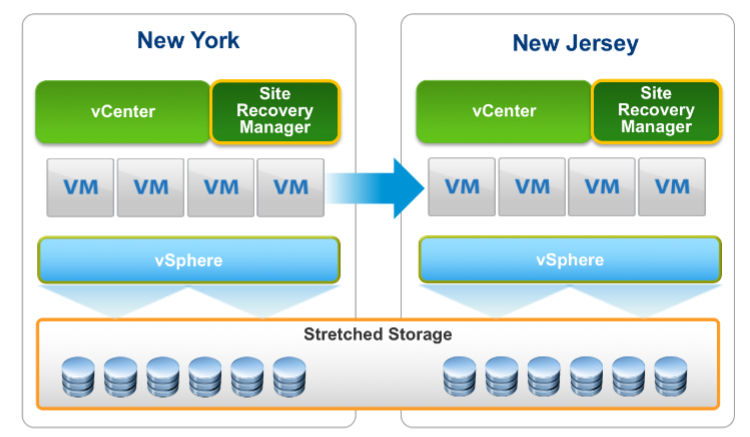 vSphere with Operations Management (vSOM) improvements. vRealize Operations Manager (vROps) has been updated to version 6.4, there are many new dashboards (Operations Overview, Capacity Overview and Troubleshoot a VM) and analysis tools. Also, Log Insight 4.0 has been announced. vCenter Server Appliance improvements. Now vCSA has exclusive features as compared to the traditional vCenter – for example, Native High Availability to provide vCenter availability and integrated VMware Update Manager. Also, there are vCSA backup and recovery mechanisms. Updated vSphere Web Client. There is a lot of improvements, including updated interface. Updated Virtual SAN API and vSphere PowerCLI. Now management interfaces from command line and external systems have been essentially updated and elaborated. It became possible to automate configuration and settings control for cluster, disk groups, fault domains and expanded clusters. Cross-cable 2-node configuration support. Before, Virtual SAN cluster could be built of minimum of three nodes, which blocked technology implementation for SMB and ROBO. Now it’s possible to create 2-node configuration, in which hosts are interconnected with cross-cables (no switches) and to deploy there both virtual infrastructure and virtual machines storage. 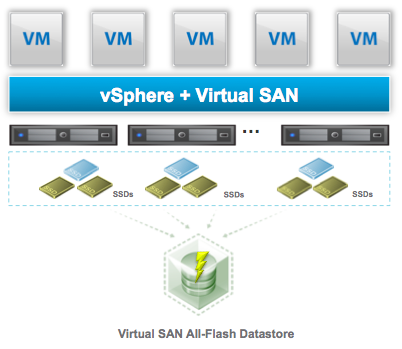 Increased Virtual SAN 6.5 flexibility. Now Virtual SAN targets can be used for physical servers, which makes the solution much more flexible in terms of the data storage for the enterprise. iSCSI targets for Virtual SAN functionality is managed in a similar way the virtual objects do through Storage Policy Based Management (SPBM) mechanism. Containers support. With vSphere Integrated Containers Engine Mechanism Virtual SAN 6.5 supports Docker containers and others. Docker Volume Driver specially designed for vSphere allows managing data of containers located at VMFS, NFS, and Virtual SAN storages. New hardware support. Together with VMware vSphere 6.5, Virtual SAN 6.5 tools support new hardware, like high-capacity 512E disks, as well as NVMe – access protocols to SSDs through PCIe wire. Complete compatibility with VMware vSphere 6.5. This includes full integration with vCenter HA, migration with vCenter on vCSA support, protection of virtual machines, which use encryption functions, two-factor authentication support and integration with new vSphere Guest Operations API. SRM и VVols compatibility. 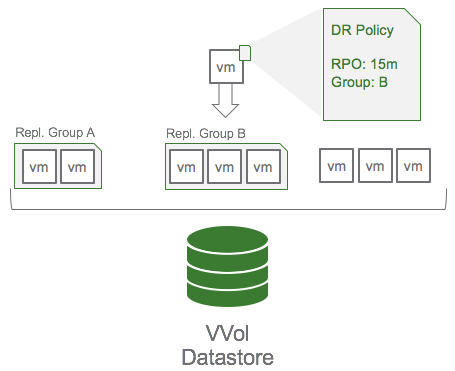 In addition to all new features announced in Virtual Volumes (VVols) 2.0, SRM 6.5 now supports virtual machines protection on VVols with vSphere Replication technology. API and vRealize Orchestrator plugin improvements. There are many various improvements to SRM 6.5 program interfaces and several new features in API. vSphere Replication RPO. For vSphere Replication technology, which SRM is powered by, now Recovery Point Objective (RPO) policies are supported. In some architectures, they come up to 5 minutes. New vROps SRM Management Pack. Now vRealize Operations, which is an integrated monitoring and problem resolving solution for a virtual infrastructure, has a special pack for SRM, which allows to monitor the SRM server itself, as well as the protection groups and recovery plans directly from the vROps console. Array-based replication support. Before, to provide DR and fault tolerance and achieve zero RPO for VMFS volumes, the datacenter managers used array-based replication (ABR) technology. For virtual machines based on VVols 2.0 this technology is accelerated – now it is possible to replicate not only VMFS volume entirely, but a single virtual machine (and even virtual disks separately). Disaster Recovery automation. VMware vSphere 6.5 provides extended API and PowerCLI commands, which allow to ensure orchestration of disaster recovery process. Line of Service concept. VASA 3.0 interface datasheet introduces Line of Service concept. This is a group of interconnected entities, like inspection, compression, encryption, replication, caching or persistence, which perform some specific task. Virtual Volumes for Oracle RAC support. In addition to the array-based replication, VVols 2.0 technology will be fully supported for Oracle RAC clusters (as now it’s supported for VMFS volumes). That’s it! Having read this, you are now aware of the news of VMware core products, which will be available in their new versions in Q4 2016. How VMware sees IT future. VMworld 2016. Day 1.